Author bio: He is a master lure maker and fisherman. He is also the author a number of best selling fishing and angling books and has written many articles on fishing for leading outdoor magazines and newspapers. This book details, step by step, the construction and assembly of almost every type of lure used in fresh and salt-water fishing: plugs, spin bugs, spoons, spinners, jigs, metal squids, and eel and eelskin lures. More than one hundred and fifty line drawings illustrate the tools that are needed and how the various lures are put together. There are complete details on how to make sinkers, leaders, and connections, and how to care for and repair lures. -Wooden plugs - the easy way to make these, get started with a broom handle! -The eight most popular shapes - used for making spoons. 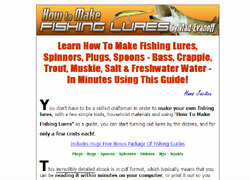 -How to care for and repair - your lures.